Admittedly, not all of the heraldry we found was real coats of arms. But still, even the faux heraldry serves to illustrate that the use of coat armor is alive and well. So let me share what I ran across in our travels, good, bad, and indifferent. 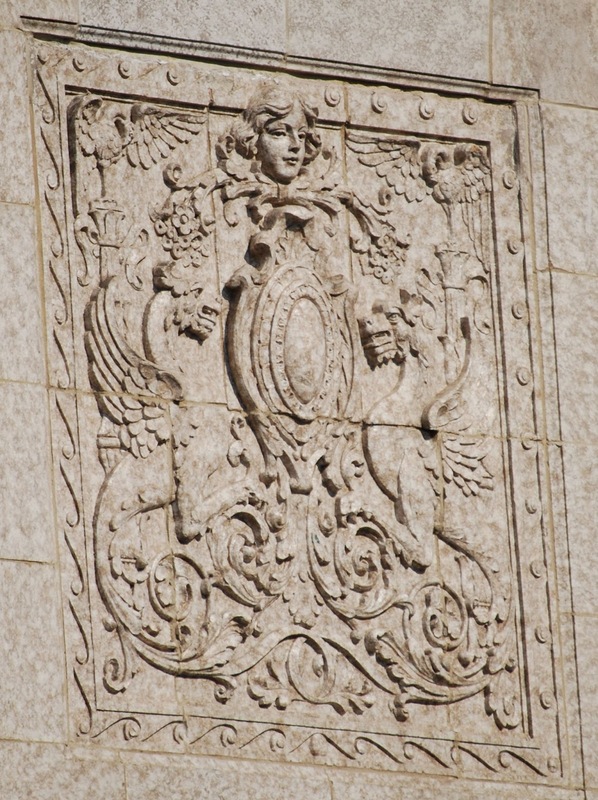 First up is the first piece of faux heraldry I saw, directly across the street from the Fort Wayne convention center, on the facade of the Embassy Hotel. As you can see, the "shield" is blank, but it is otherwise organized very much like a complete achievement of arms, with a human face taking the place of helm and crest and a foliate design with flowers serving as mantling. The shield is being supported by two bird-winged wyverns resting atop a "gas bracket" compartment. There are also two pelicans atop a pair of columns vulning themselves in the upper corners of the rectangle containing the achievement. 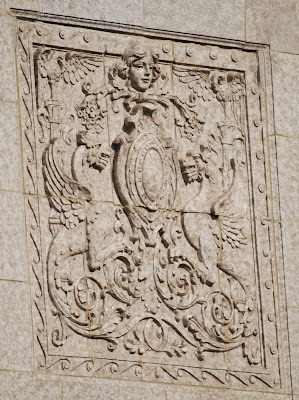 It's a wonderful bit of carving (several identical panels ran across two sides of the hotel) and architectural decoration, but I find it a real shame that the shields are blank when it would have been so easy to carve a real coat of arms there. * For my foreign readers, that's a line from the old TV show "Hee Haw," which would name some usually small town in America, give its population size, and then everyone in the cornfield would salute while saying "Salute!"